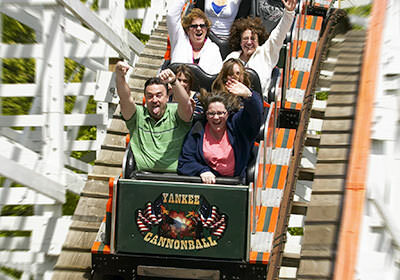 UNTAMED is Canobie Lake Park’s newest roller coaster and there is nothing like it in New England! 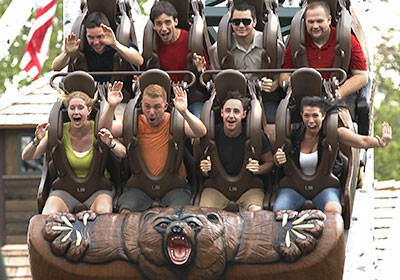 UNTAMED’s grizzly bear cars lift riders 72 feet into the air, then into a drop that’s beyond vertical at 97° degrees! 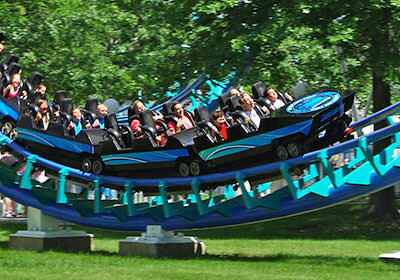 Through a series of loops, banked turns and zero gravity rolls, UNTAMED is truly one wild ride! The corkscrew is a steel roller coaster featuring one large drop and two corkscrew loops. Spin away on our newest attraction... Ice Jet! 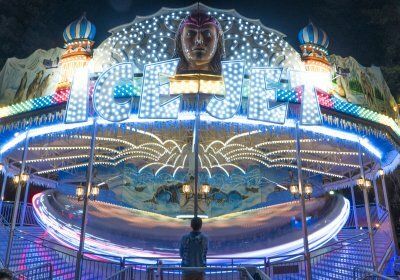 Ice Jet brings back the nostalgic feeling of our classic Matterhorn but with an amazing lighting package! Ice Jet will make you feel like you're going back in time at warp speed! 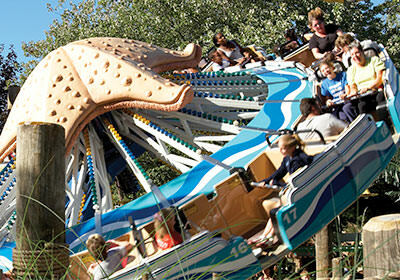 Modeled after an Old Spanish Galleon, the Pirate Ship is one of our most popular thrill rides in the Park. Up to 45 passengers at a time get to experience the feeling of life on the high seas. As the ship swings higher and higher, guests get a good view of the ground below from a nearly 90° angle. 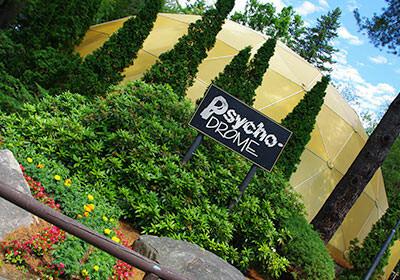 The Psychodrome is a "Scrambler" ride in an enclosed area accompanied by music and strobe lights. 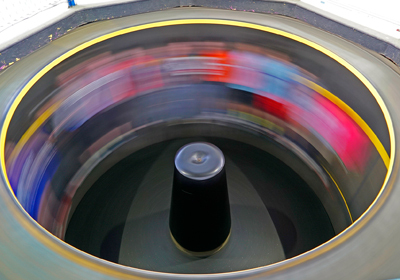 The ride itself is a dual action spinning ride, meaning that the riders are seated in one car in a series of four that spins in a small circle, while at the same time, all the cars are connected to a center shaft that spins in a larger circle. 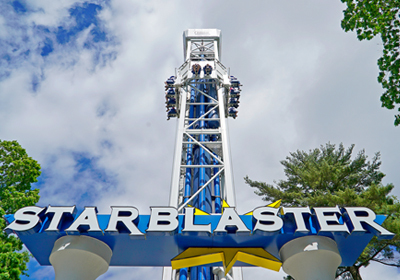 The Starblaster is one of the most extreme attractions in the park, combining the anticipation of a space shuttle lift-off with the thrills and excitement of the bungee jump. 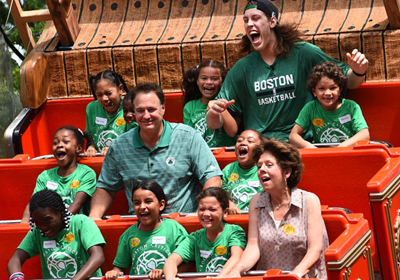 Riders are blasted not once but twice up the 80-foot tower in a brief but exhilarating ride, all the while experiencing forces equivalent to 3 G’s. 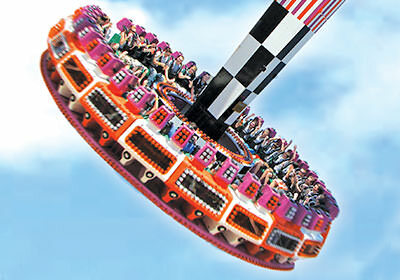 Once the ride reaches top speed, the floor drops out, leaving the riders “floating” in mid-air. At this point, the force exerted on the riders to keep them from sliding down the wall is just under three times that of the Earth’s gravitational pull. In other words, the riders will be experiencing almost 3 G’s. Wipeout is an intense ride with a lot of thrill. Looks can be deceiving on this multifaceted ride. Riders begin spinning in a circle, the carrier rises adding increased thrill, but it doesn’t stop there. As the ride rotates in one direction, the carrier rotates the other way - skewing your perception. Just when you think you are finished, the ride reverses itself - try to catch your bearings. Spin on a giant rotating disc as you are swinging through the air on the Xtreme Frisbee!